At Wolf Creek Care Center, it is our nursing staff that make all the difference. We are committed to provide you quality medical care with responsiveness, courtesy and gentleness. We offer Post-acute care which provides a full range of medical care services including wound care physicians, physiatrists specializing in pain management and rehab, and psychiatrists that help support the individual’s continued recovery from illness including management of a chronic condition. Each of our residents comes to us with very different and specific rehab needs. Our entire rehabilitation team is committed to create individualized therapy programs that directly answer those specific needs. We encourage the resident to achieve their maximum outcomes of independence and ability. We are proud to offer Hospice Programs for those residents and families in need. We use out-sourced services from Hospice of the Foothills and Bristol Hospice to provide the best of care to those medically fragile residents. A positive and uplifting atmosphere is vital to the success of healing, recovery and rehabilitation. Wolf Creek Care Center employs outgoing and friendly professional staff to create social programs and activities to fit the residents needs. We provide a monthly activity calendar to each resident to keep them informed of upcoming events. Friends and families are always welcome to visit and attend our special events. Social services provide essential information, manage requests and concerns, coordinate appointments, maintain contact and open communication between the facility, families and the residents, help in care planning and discharge planning for each resident. 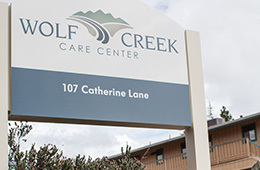 We stand up for resident’s rights and strive to make Wolf Creek Care Center their home.